Here’s the latest sales report from Media Create (and Famitsu), covering Week 6, 2019 in Japan. This week, there’s only one entry in the Top 20 provided by Media Create, and it’s not a Nintendo Switch game. Blazblue CentralFiction: Special Edition was released on Thursday, but it did not even manage to chart (which means it sold less than 2 280 units). But this lack of new releases is no big deal for the Nintendo Switch, thanks to the strong and steady sales of its many evergreen titles. 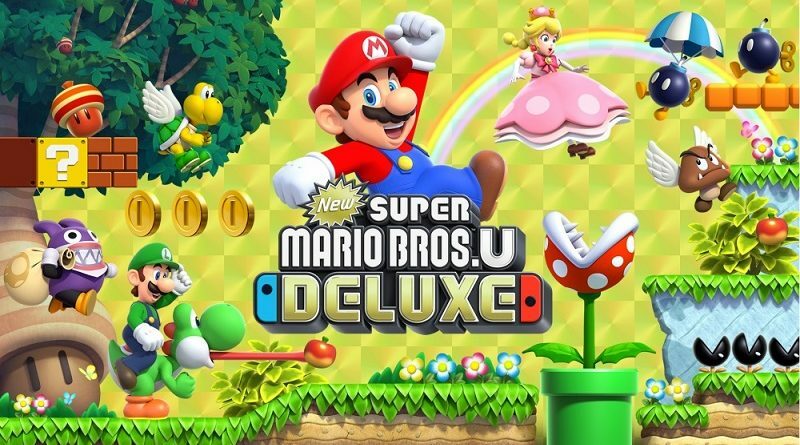 New Super Mario Bros. U Deluxe is back at the top with 38 482 units sold. That’s a rather minor drop Week on Week (-16%), but it was enough to make it miss the 400 000 units milestone (397 231 units as of this week). Week 7 it is, then, with a minor increase in sales expected (thanks to public holiday on Monday). Super Smash Bros. Ultimate is still enjoying strong sales, with 31 174 additional units sold this week (-11%). So far, its sales have been nothing short of impressive, even by Super Smash Bros. standards, which bodes pretty well for LTD sales. 3 million units is already a lock, and that milestone should be reached by the end of March. So far, 2 831 143 units have been sold at retail alone. Pokémon Let’s Go, Pikachu! / Let’s Go, Eevee! saw a significant increase in sales last week, thanks to the Nintendo Switch bundles finally getting new shipments. This week, things calmed down a bit, and sales are back to “normal” with 17 596 units (-17%, which is a pretty satisfactory drop). So far 1 475 502 units have been sold, which means the 1.5 million units will be reached by the end of the month. 2 million units LTD should be possible, though it will depend on when the next mainline entry is revealed. Week 6 is a rather “boring” week during a slow month, without anything noteworthy happening, and yet a few evergreen titles on Nintendo Switch actually saw their sales increase very slightly. That’s the case of Mario Kart 8 Deluxe, which saw its sales increase by 5% to 12 250 units. While it’s unlikely to sell as much as it did in 2018, it looks like 2019 sales are going to be pretty strong… strong enough to bring it close to the 3 million units milestone! So far, 2 120 772 units have been sold since launch. Super Mario Party sales actually dropped this week, but it wasn’t enough to prevent it from reaching 1 million units sold at retail alone. It sold 11 863 units this week (-3%), bringing the total to 1 007 947 units. No doubt the game is going to keep selling steadily through 2019. As for Minecraft on Nintendo Switch, it just keeps selling and selling like Minecraft usually does. 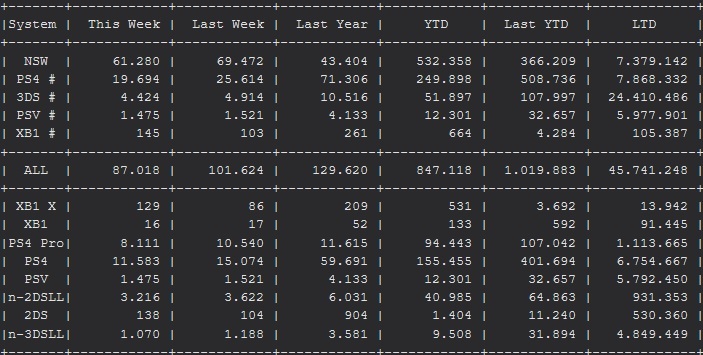 With 8 308 additional units this week (+1%), it came pretty close to the 600 000 units milestone (598 597 units to be precise). Meanwhile, The Legend of Zelda: Breath of the Wild is most certainly not selling like your typical Zelda game, far from it. It’s almost been 2 years since launch, and not only is it still parading in the Top 20 from Media Create as if it owns the place, it actually saw its sales increase slightly this week (and for no apparent reason). It sold 7 273 units this week (+5%), bringing total retail sales for the Nintendo Switch version to 1 283 831 units. Finally, sales for Splatoon 2 dropped slightly this week, with 7 068 units sold (-8%). So far, it’s 2 925 436 units LTD, and it’s slowly but surely squid swimming its way to the 3 million units milestone at retail alone. Right now, it’s not clear whether it will manage to reach it before Super Smash Bros. Ultimate or not! 16./20. [NSW] Fitness Boxing (Imagineer) – 2.789 / 26.121 (-23%). It’s certainly intriguing that this one is still hanging around in the Top 20 so many weeks after its release… especially as it did not even chart during its launch week! 19./31. [NSW] Kirby Star Allies (Nintendo) – 2.453 / 730.492. Just like Super Mario Odyssey, it’s back in the Top 20 from Media Create this week. As expected, sales went down for the Nintendo Switch this week, following the re-release of the Pokémon: Let’s Go, Pikachu! / Let’s Go, Eevee! bundle the week prior. That being said, they remain at an unexpectedly high level, with 61 280 units sold; in comparison, “only” 43 404 units were sold during the same week in 2018. The Q1 line-up for the Nintendo Switch may not be the most exciting one ever, but thanks to the strong and steady sales of the various evergreen titles, Hardware sales remain equally strong and steady as Software sales. And it’s not just the case for this particular week: it’s been the case since Week 1, 2019. So far, the Nintendo Switch has sold over 166 000 units more than during the same period, last year, which bodes really well for the rest of the year (especially if Nikkei’s rumours about a new model are spot on). So far, the Nintendo Switch has sold 7 379 412 units LTD.
As for the Nintendo 3DS, Media Create report 4 424 units sold this week. Sales remain steady, albeit unimpressive.